Everyone wants to be a leader, or so it seems these days. You’ve got people clamoring for the title (and the pay, sometimes). But not everyone is ready or realizes the dangerous traps every leader will face. There are plenty. They can destroy a leader. 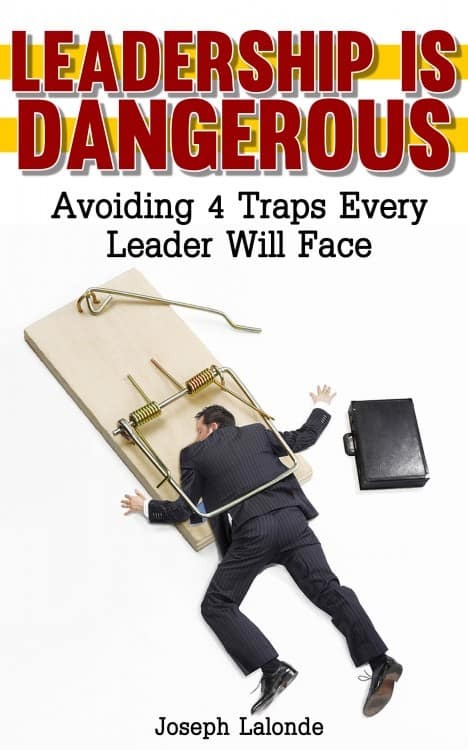 And that’s why I created the free eBook Leadership Is Dangerous: 4 Traps Every Leader Will Face. I wanted to warn you, the emerging leader, that there will be trials you’ll face. Most are common issues that are overlooked, especially by those who are just beginning the leadership journey. However, this doesn’t mean someone with years of leadership experience won’t get something from Leadership Is Dangerous. Quite the contrary. My feeling is we all need to be reminded of what’s tempting us. What’s calling for our attention. What’s the trap in front of us. So, whether you’re new to leadership or a seasoned leader, I know you’ll find something in Leadership Is Dangerous that will help you avoid these dangerous pitfalls. When I heard that Joseph Lalonde was producing an eBook, I knew that it would be full of practical wisdom for emerging leadership. Joe has successfully assembled a proactive guide to learning from the pitfalls that I have seen trip up so many leaders. I’ve always believed that prevention is the very best cure – Leadership is Dangerous will equip the reader to navigate the challenges that lie ahead. In Joseph’s new book, Leadership is Dangerous, he really puts his arm around the new (and not so new) leader and leads them step by step towards being a great leader and avoiding the traps along the way. I would recommend every leader read this quick, inspiring book. That’s right, I’m giving Leadership Is Dangerous away for free. It’s because it’s a message I believe strongly in and I don’t want to see leaders fall into the same traps over and over again. So, you can get a copy of the eBook for free. All it takes is an email address and confirming your subscription to my blog. Get your free eBook and leadership tips by filling out the form below.